Make any gothic outfit look unique with the help of this stylish womens arm guard! 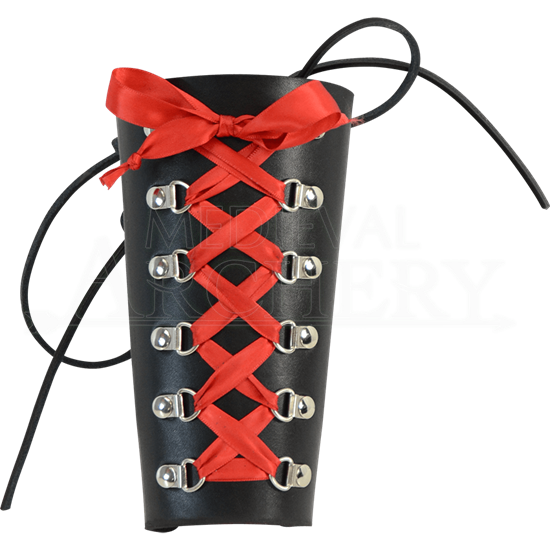 The Ladies Gothic Leather Bracer displays a crisscrossing, corset-style ribbon that runs down the front as a colorful decoration. Available in red or purple, the satiny ribbon stands out brightly against the black leather of the gothic bracer. The bracer has a lace up closure on the back which allows for considerable adjustment in fit, ensuring the comfort of the wearer. Crafted right here in the USA, this gothic accessory makes an eye-catching addition to any gothic ensemble! Our Gothic Leather Bracer is sold individually and can be worn on either arm. If you are going for a look that requires one on each arm, be sure to add 2 to your cart.